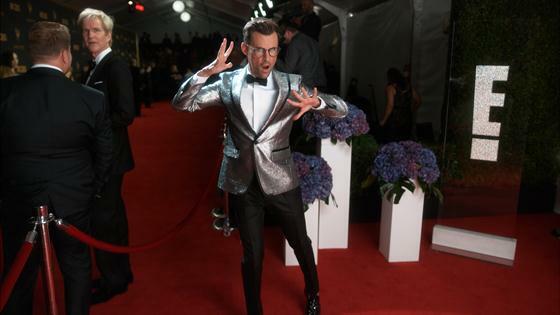 Brad Goreski is setting sail for married life! The 40-year-old celebrity stylist and star of E! 's Fashion Police wed Gary Janetti, a 51-year-old TV writer and producer, on the luxury cruise ship Seabourn Sojourn on Tuesday at sunset during a trip to the Caribbean. The ship's captain, Tim Roberts, married the couple. The grooms wore custom Isaia suits and sported custom wedding rings designed by jeweler David Yurman. "We're married!" Goreski wrote on Instagram. "After over 16 years together @garyjanetti and I finally tied the knot aboard the @seabourncruise Sojourn with our close family in attendance! We couldn't be happier!" "They were so happy to share the moment with both families," a source told E! News exclusively. "The ship made the experience very special. They had a beautiful ceremony at sunset and then set sail with a family dinner. Both Brad and Gary couldn't be happier." Goreski and Janetti got engaged more than three years ago. "We've already been together for 13 and a half years, so there's really no rush to get it done," Goreski told E! News at the time. "But I'm really excited to marry the man I love. It's a great thing. I never thought that that would be a possibility. It's such a cool thing."